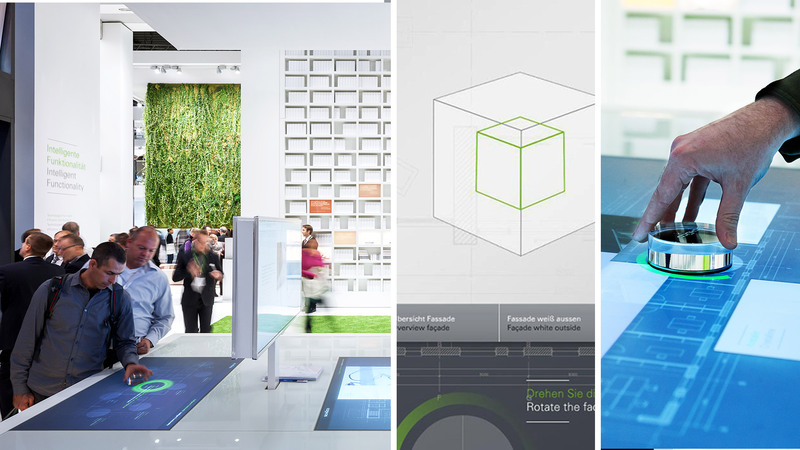 Mediatecture at the BAU 2013 conveys complex contents playfully and closely intertwined. 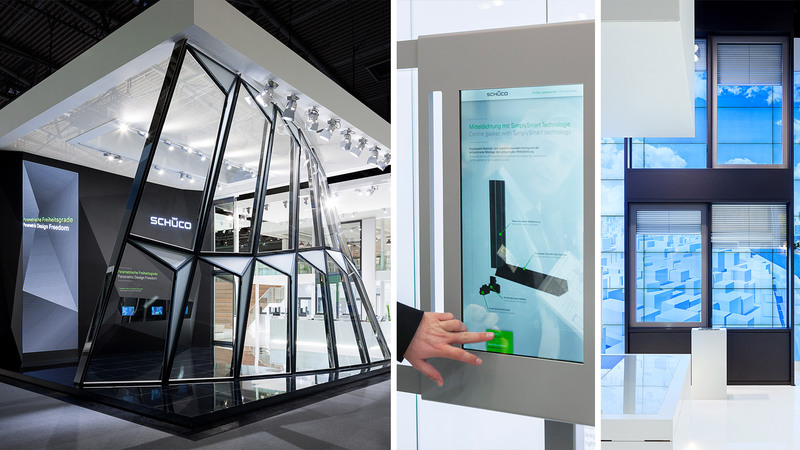 At the BAU 2013, Schüco conveys its highlight topics via an intelligent choreography of manifold marketing tools as well as by means of a fair design, which intelligently uses the innovative mediatecture elements. 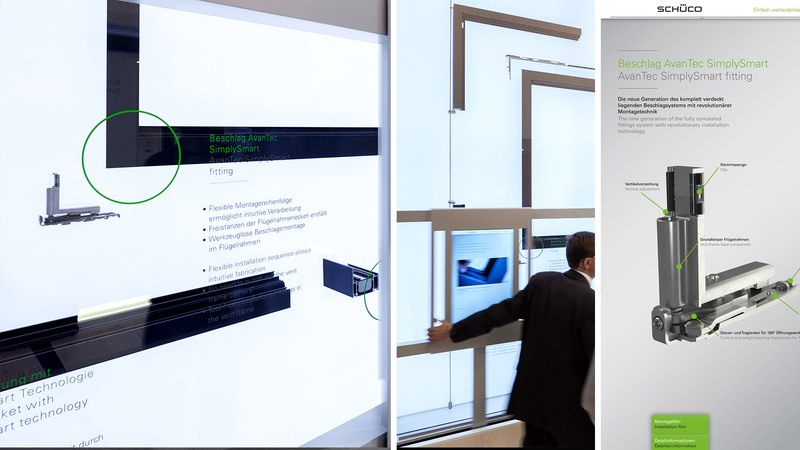 In all topic studios, touch-screens, shift-screens and the so called expert table comment the Schüco highlights at the BAU 2013: Seven highlight topics at the expert table can be operated via the horizontal touch-screen in order to communicate them over a visible, vertical display for all visitors. The expert table convinces thanks to its operating concept‘s dramaturgy: A freely selectable object control via token allows for an intuitive use of the station. Thus, also the highly complex Schüco contents can be explored simply and playfully. 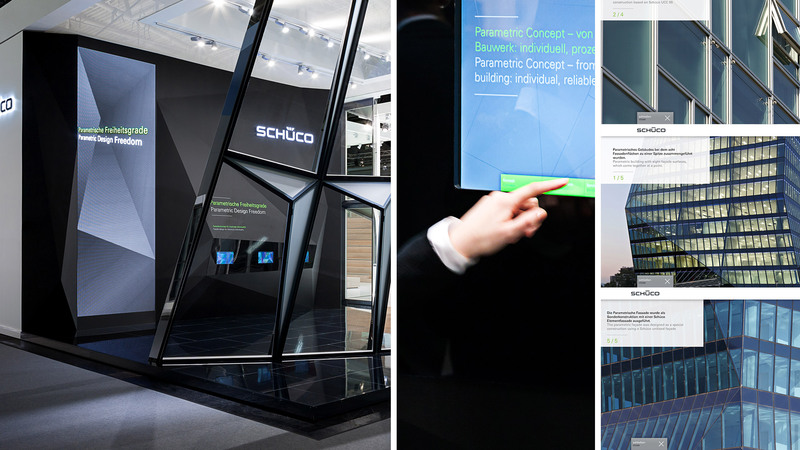 In the topic studio “Simply smart” there are 3 media components, which interact playfully: two backlit Schüco exhibits of the window system Schüco AWS in showcases, the graphic highlighting of all innovations as well as two shift-screens with touch-screen function, which can be controlled via all exhibits. The tripartite arrangement allows interested visitors to directly approach all highlights via the screens and to also grasp them in depth by means of the touch-screens. The mediatecture of all other topic studios also simplifies the exploration of the contents according to the target groups’ individual demands.